Jay Sekulow—one of America’s most influential attorneys—explores a post Obama landscape where bureaucracy has taken over our government and provides a practical roadmap to help take back our personal liberties. Jay Sekulow is on a mission to defend Americans’ freedom. The fact is that freedom is under attack like never before. The threat comes from the fourth branch of government—the biggest branch—and the only branch not in the Constitution: the federal bureaucracy. The bureaucracy imposes thousands of new laws every year, without a single vote from Congress. The bureaucracy violates the rights of Americans without accountability—persecuting adoptive parents, denying veterans quality healthcare, discriminating against conservatives and Christians for partisan purposes, and damaging our economy with job-killing rules. Americans are bullied by the very institutions established to protect their right to life, liberty, and the pursuit of happiness. Our nation’s bureaucrats are on an undemocratic power trip. But Sekulow has a plan to fight back. We can resist illegal abuse, we can reform a broken system, and we can restore American democracy. This book won’t just tell you how to win, it will show you real victories achieved by Sekulow and the American Center for Law and Justice. Unless we can roll back the fourth branch of govern­ment—the most dangerous branch—our elections will no longer matter. Undemocratic is a wake-up call, a call made at just the right time—before it’s too late to save the democracy we love. Jay Sekulow is widely regarded as one of the foremost free speech and religious liberties litigators in the United States, having argued twelve times before the US Supreme Court in some of the most groundbreaking First Amendment cases of the past quarter century. As chief counsel of the American Center for Law and Justice (ACLJ), he is a renowned constitutional attorney, an international expert on religious liberty, and an acclaimed and distinguished broadcaster. Jay is a passionate advocate for protecting religious and constitutional freedoms with an impressive track record of success. His steadfast determination and commitment to protecting these freedoms is expansive with his work resulting in a lasting impact across America and around the world. He is a member of President Donald Trump’s legal team, and he is also a popular talk radio host and regularly appears on major media, including Fox News, CNN, ABC, NBC, CBS, and other outlets. 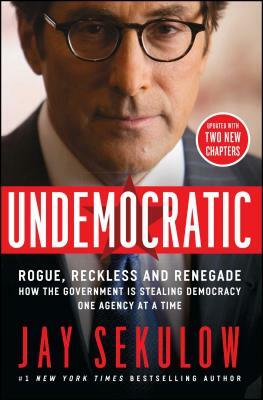 "If you read just one book this year, read Undemocratic—and prepare to have your eyes opened to the true crisis facing our republic." "Jay Sekulow is one of the top lawyers for religious freedom in the United States." "The American Center for Law and Justice is the leading advocacy group for religious freedom."